1 cup of Thuvar dal. 1/2 cup of channa dal. Clean the Methi leaves and keep it aside. In a pressure cooker, add the thuvar dal, channa dal, moong dal along with asafoetida, cumin seeds , turmeric powder , chopped tomato , garlic and with sufficient water.Allow it for 4 whistles. 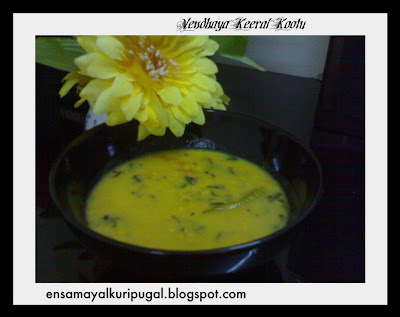 Heat oil in a pan, add mustard when they stop spluttering add the urad dal and curry leaves. Add the chopped chillies and onion. Saute it for 5 mins. Now add the cooked dal along with the methi leaves and salt. For more taste , you can grind half cup of coconut with cumin seeds to a smooth paste and mix them after the leaves turn soft. Hi.It is my favorite love having it with hot rice. 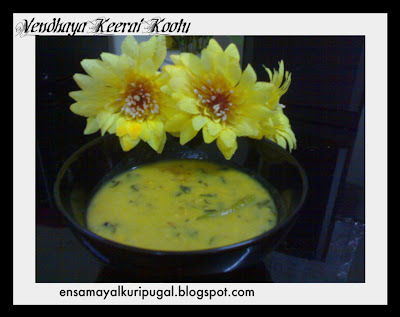 Incidentally I have also posted a recipe with fenugreek..
Lovely and delicious fenugreek daal..love the methi.. Healthy and yummy for sure. love to have this dal with nice steaming rice and some curds..great recipe.. Such a healthy kootu, looks yumm!! Wow all the dhals in one thats really very tempting and healthy!!! Thanks for visiting me...i luv fennugreek leaves n ur dal luks yum. Must be a great tasting koottu. Never tried the combination of dhals with fenugreek greens. Surely too delicious dear..! This is new to me, shud try it soon! I generally add coconut to this kootu..nice presentation..following you..